I am fortunate enough to have a wonderful outbuilding on my property that my wife says I can turn into a full workshop. With any luck, the budget should be there this fall. Plenty of space, stubbed for a bathroom, and best of all, I kind of have carte blanche from the wife as long as she gets to come play in it too. Overall shop is about 25×40 with a full second story and an attached 15’ RV slot along the long wall, which is currently home to a large stack of cherry and cottonwood that is air drying. Soon to be home to my wooden dinghy when I get it done in a few weeks. That will be a truly satisfying project to post. I’m looking at probably a 200a panel if I can swing it with new trenched feeder line. I’ll be running ethernet conduit and a spare conduit when I trench since it won’t be that hard and the trench is already open. I’ll have to double check my spacing, but I think 10” from the electrical is the magic number. I may run new water out there, again, since the trench will be open and it will be easy. The current water is burried copper and goes to a weird shut off. I’ll be putting in a small heat pump/ac or something to make it more tolerable in the winter, and keep the plumbing from freezing. I don’t currently have any plans for the upstairs part of the shop other than insulate it and perhaps storage. What I’m working through is a general plan for how to organize my shop and where I need to run new outlets and eventually dust collection. I figure they’ll drop from the ceiling in approximately the same place. I do plan to run at 2-4 retractable extension cords at intervals from the ceiling. My teacher had that in a class I went to recently and it was the coolest thing ever. Here is my first attempt at layout. The weird dashed lines under the planer is the car pit, which I’ll be covering up somehow. I plan to probably put my rubo bench and another layout/glueup bench in the large open area. I’m really not sure where to put a bandsaw. Maybe it should go closer to the garage door. The indoor lumber storage on the back wall is mainly there because I already have some shelves up. I’m not sold on keeping it there. Other than the toilet and sink, everything can move. Oh, and wheels will be on all the major floor equipment so they can move if necessary. I’m just hoping to limit the rewiring once I get it in. By subscribing to the RSS feed you will be notified when new entries are posted on this blog. -- Norman - I never never make a mistake, I just change the design. 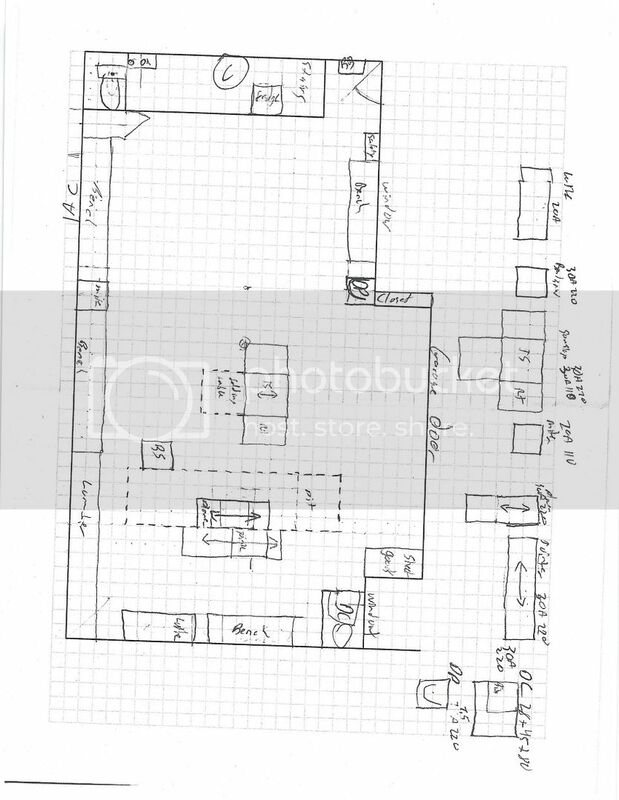 Take a look at the Grizzly Shop planner template, makes switching tool locations fun! -- Lifting one end of the plank. you can plan all you want but it seems it will never be perfect until you get in there and start using it then i can assure you changes will be made as time goes by.putting all the machines on wheels is great so when you need to rearrange it will be easy.my shop has been reconfigured numerous times due to new equipment or just making things work better,it never is perfect.all my dust collection ducting is pvc,no glue just taped joints so i can easily take it apart and reconfigure when needed.and you can never have too many outlets.the ceiling cords are great i have 110v & 220v in 4 places.have fun with it and enjoy the journey,and please post shop pics when it’s up and running. -- sawdust the bigger the pile the bigger my smile-larry,so cal. Grizzly’s planner can be a big help. Think about how you work when laying it out I like the equipment to be laid out for easy flow of material, jointer and chop saw in close proximity to the table saw I would suggest plywood storage close to your table saw , my shop is set up to tilt out a sheet from storage turn and lay one end on the table saw. Wood storage, in general, is a must, wood is best stored flat but hard to sort through it when in a big pile so I would suggest having wood stored on end with separate partitions similar to how long wood is stored at your lumber suppliers. Another thought about laying your equipment out think about having plenty of room to run long material through your planner and drum sander if possible a minimum of 12ft in front and back of both of those tools. The 200 amp electrical box you plan should work unless you plan on using older 3 phase equipment. I put 110 outlets every 4ft and 220 every 6ft around the perimeter, also think about a couple of rows of 110 outlets on the ceiling and plenty of LED lighting. I have a chase in the floor running the length of my shop for dust collection, electrical and air supply. This may be hard to do if you have an existing slab but not impossible. To save on noise and in my case floor space. I placed my dust collection and compressor outside in a little shed style roof enclosure. You may want to think about Wifi for your shop. Good luck with your new shop. Thanks for the post. I’m also planning a new shop and the ideas are great. The only thing I would recommend is make sure that you have good lighting planned. There is nothing like sitting at a bench and casting a big shadow on the project you are trying to work on because the light is on the wrong side.